Gianluca Dettori is the founder and chairman of dPixel, a consultancy company opereting in the tech venture capital industry. Gianluca is 44 years old and has been working in the internet industry for 15 year and in the tech venture capital industry for 10 years. Former manager in Italia Online (Olivetti) and General Manager of Lycos Bertlsmann for its launch in Italy. In 1999 he founded Vitaminic, a music distribution platform, becoming its CEO and succeeding in its IPO in the year 2000. After the merging with Buongiorno SpA in 2003, Gianluca became M&A manager of Buongiorno Vitaminic Group and vice-chairman of the board. In the last 10 years he invested in Vivaticket, Im3d, Sitonline, SmartRM, Crowdengineering, Banzai, SEOLab, Kiver, Sounsay, Ibrii, Liquida and Urbissimo. 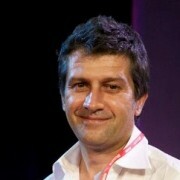 Gianluca also writes on “Wired – Italy” and on “ Il Sole 24 Ore – Nova 100” about the Internet and VC topics. He graduated in Business Administration at the University of Turin, he founded and was the first president of IAB (Internet Advertising Bureau) in Italy, co-founder of First Generation Network, Fullbright mentor and Kauffman Society member.